Yes, despite leaving the CATs at home with the cats in 2012, it was true I still loved SCTs best. Well, maybe that was true, or maybe I was whistling past the graveyard. Those words were written just after I completed the observing project of a lifetime, The Herschel Project, my quest to view all 2500 Herschel deep sky objects. Chasing down more than two thousand galaxies, nebulae, and star clusters over the course of a mere three years, especially given our weather and my work schedule at the time, ensured I was sorta wrung out and ready for a change. Oh, I continued on for the next two years much as I had, using my SCTs to slowly, ever so slowly, tie the ribbon on the H-project. Using my C11, Big Bertha, and my C8, Celeste, to clean up a few objects here and there. Some that I wasn’t 100% sure I’d identified correctly, and some that I wanted to re-image with my new color Mallincam. That’s what I told myself I was doing anyway, but the truth, I think, was really that I had no idea what—if anything—came next for me in (amateur) astronomy. I did try to get various new observing projects off the ground. I started in on the ARPs, for example, observing them in much the same way I had the Herschels. Some visual observing with the C11 and the 12-inch Dob and lots of video observing with the C8 and C11. It, like every other project I tried, however, fell flat. With a resounding thud. I was worried. Had finishing the Herschel Project also finished amateur astronomy for me? “Began to change”? Not hardly. The astounding thing was that I went to bed one night in early 2015 (after imaging that winter’s cool little comet) feeling much the same as always, and awakened feeling entirely different. What concerned me now was no longer observing projects, but the questions above and many more like them, which suddenly seemed more significant than Arp galaxies. 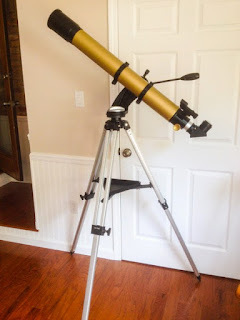 I also began to look with dismay at all the astro-junk I’d accumulated over the last 25 years of my near 50 years as an amateur and began to thin the herd. I won’t bore you with the answers to some (not all) of those questions I’ve come up with so far. Every person has to wrestle with these things for themselves and the answers you arrive at may be starkly different from those I’ve arrived at. We’re talking astronomy here, anyway, and the point is that being preoccupied with deeper thoughts meant I didn’t want to worry about, struggle with, or obsess over telescopes anymore. I did still want to observe, though. I just didn’t want to be bothered by my telescope when it was time to watch the skies. The C11 was out. So was the C8. I didn’t want to spend 30-minutes setting up a scope. Heck, I didn’t want to spend 2-minutes. 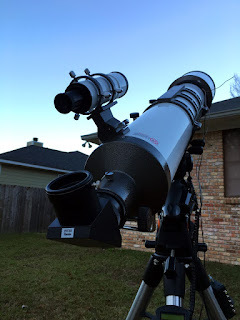 In the months immediately following that 2015 winter’s night with the comet, the yen to look at the stars often came on the spur of the moment, and our AR102 4-inch achromat or my C102 4-inch achromat on a light SkyWatcher AZ-4 alt-azimuth mount didn’t bother me. I’d put one of the refractors on the mount and carry it into the backyard in a single piece. No drives, no batteries, no computers, no aggravation, just me contemplating the cosmos. Yes, I will admit I missed the light gathering power of the SCTs at first. My solution was to buy an inexpensive and ultra-simple 10-inch solid tube Newtonian, a GSO Dobsonian, Zelda. She is almost as quick and painless to set up as the refractors. Do I use her a lot? I did when I first got her, but of late not quite so often despite her simplicity. This past year, my refractors have been in the backyard more often than the big 10-inch. What changed? I began concentrating on what I could see with my "small" refractors rather than what I couldn't. When I learned to do that, it was as if the deep sky became new to me again after all these years. I won’t tell you I was seeing more details in my favorite objects, but I was seeing a different, a new—or at least forgotten—aspect of them and I welcomed that. It wasn’t just my new mindset that impelled me begin a more relaxed sort of visual observing. It was my body. No, age didn’t suddenly catch up with me, or at least that was only part of it. I was washing down the front porch of good, old Chaos Manor South just after we moved out. Stupidly, I was wearing flip-flops, slipped on the soapy front steps, and crunched my back—but good. I was in pain for a while, but it seemed as if I’d dodged a bullet and just gotten bruised up and that would be the end of it. Guess again, Skeezix. Last summer, it became obvious that was not the case. I did something that aggravated that back injury. I don’t know what it was, but I was in real pain for weeks. Carrying a C8 into the yard would have been laughable. 3-inch and 4-inch refractors became my lifelines to astronomy. And I had so much fun with them that when my back pain suddenly subsided—almost overnight—my inclination was to stick with them. Sure, I could have gotten a similarly light and portable CAT, a C5 or a C6 SCT, or a 4 or 5-inch MCT, and used it in similar grab ‘n go fashion, but the refractors, and especially the AR102, had the additional benefit of giving me wide-field views at my dark site. That's something I seem to favor these days. Maybe just because I am weary of examining tiny bites of the sky, looking at PGC smudges, after the years of the Herschel Project. Or, maybe, thanks to my new philosophical bent, I have come to want to see the big picture. I'd also be lying if I told you I haven’t begun to appreciate a certain refractor je ne sais quois. What is that special something refractors are supposedly imbued with? There is one overriding advantage to them: they are unobstructed systems. There is no secondary mirror getting in the way of the of the objective lens. That has several benefits. First, the light gathering power of the scope is not compromised by the blockage of the secondary. You get the full effect of the aperture you’re paying for; it’s not “4-inches minus the secondary mirror.” That helps some, but not really a lot, since the light gathering power of the telescope is dependent on the area, not the diameter of the mirror or objective. Still, more light is always better than less. A refractor will deliver more light than a reflector of the same aperture not just because of the absence of the light blocking central obstruction, but because a higher percentage of light is transmitted through a lens than can be reflected by a mirror. As the coating of a mirror ages, its reflectivity decreases and a refractor continues to pull ahead, often to the tune of 1 or 2-percent a year. Somewhat better light gathering power aperture for aperture is not the largest advantage of a lens-scope, though. What is more important is the better contrast offered by them. The lack of that central obstruction results in sharper, higher contrast images. Not only does that help with details on Solar System objects, stars often look better in lens-scopes. You often hear refractor-philes say stars are “smaller” in a refractor than in a reflector. That is due in part to refractors often being smaller aperture, shorter focal length instruments than the average reflector. But that is not the whole story. As you probably know, stars are not perfect pinpoints in any telescope. The merciless laws of physics make that impossible. What we see is an “Airy disk” surrounded by diffraction rings. Here’s the thing: thanks to the missing secondary mirror, refractors distribute less energy into the diffraction rings and more into the Airy disk than obstructed telescopes. Stars tend to look “smaller.” If you’re trying to split double stars at the limit of the telescope’s resolution, the less prominent rings in a refractor may make the difference between success and failure. Finally, one of the most important advantages of a refractor for me these days is one’s thermal stability. Despite their closed tubes, refractors require considerably less time to cool down than reflecting telescopes. The lens is less affected by changes in/changing temperature than a mirror and is ready to deliver good images more quickly when moved from a warm house to a cold yard. Despite our relatively mild climate, I find my 6-inch refractor is ready to go much sooner than my 5-inch Maksutov Cassegrain. None of the above is to say reflectors don’t have advantages; they do, of course. They are cheaper per inch of aperture, available in (far) larger apertures, and are more portable in larger sizes. These things are true, all things being equal, but all things are rarely equal. 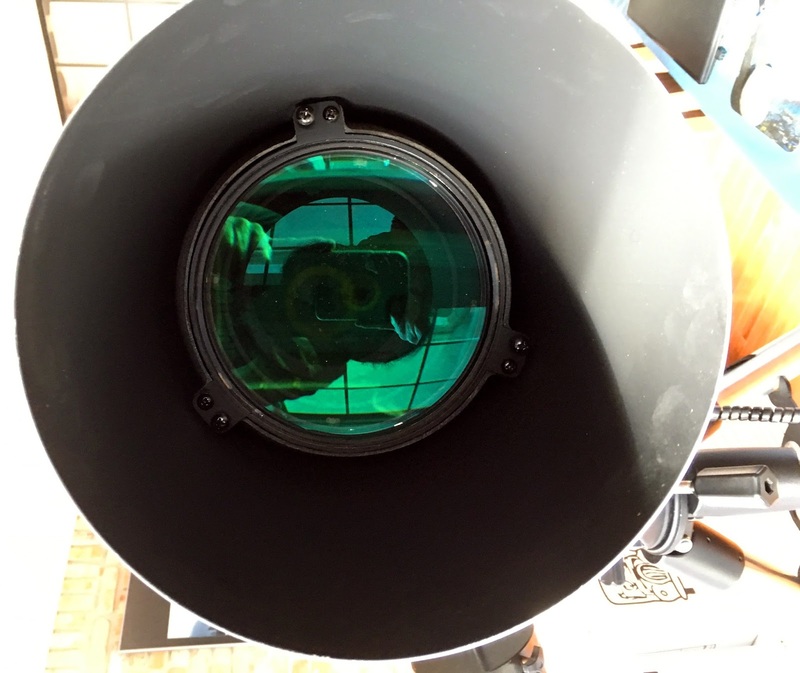 A 6-inch achromatic refractor is still considerably more expensive than a 6-inch (or 8-inch) reflector, but 6-inch achromats are much more affordable than they have ever been. If you just have to have 12—or 20—inches, you don’t want a refractor, true, but many of us, especially those of us focused on imaging, find we don’t need more than 6-inches of aperture to be happy. Portability? 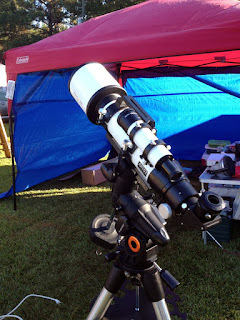 A 6-inch Newtonian is nothing; a 6-inch refractor is something of a beast. Nevertheless, I find setting up my 6-inch on a GEM to be easier than setting up my fork mounted Ultima 8 was in the old days. There’s also the color question. “False” color, the purple fringing around bright objects in some refractors. This chromatic aberration is not necessarily a deal breaker. APO/ED refractors that show virtually no false color are, like achromats, cheaper than ever. Also, some people are more disturbed by color than others (as we baby-boomers age and our corneas yellow a little, we become ever more happy with “just” achromats). Finally, most of us don’t spend much time observing that bane of achromats, Venus; usually we are viewing deep sky objects that show little or no false color. The ground truth for me is that the refractor advantages, sharp images, the portability of smaller aperture refractors, and their relative immunity to cool-down issues, have made these telescopes more practical for me for visual use now. Most of the time. There are still times when I just have to drag out my trusty 10-inch Dobsonian. BUT—and I hope I am not turning into a refractor snob—when I look through that Newtonian, something, that ineffable refractor something, is missing. While I have not done a lot of video imaging since the end of the Herschel Project, that doesn’t mean I haven’t done any astrophotography. Admittedly, I laid off for a while following that night of the comet, but when I eventually picked it up again and began doing some simple, informal deep sky imaging with my DSLRs, I actually found it relaxing. Since I was using refractors for visual work, it seemed a natural to continue with them for photography. And was I ever glad I did. The best thing about refractors, for me anyway, is their imaging capability. Affordable apochromats may be the best thing to hit amateur astrophotography since the death of film. Let me say here that I have recently been experimenting with imaging with inexpensive achromats, and I’ve been amazed at what they can do, but if you want to do astrophotography, you want an ED scope. One of the things I'd known for a while, but had filed away in a little drawer in the back of my mind, and only recently taken out (along with some non-astronomy related things) and examined in detail is that deep sky imaging is just easier with a refractor. As you know, I've taken many a shot with SCTs over the years, but my results were never, frankly, quite as good or easy to get as what I can achieve with my 5-inch APO refractor given my modest skills. Sure, if I could afford an AP or Bisque or 10Micron mount I might still be slapping a big CAT on the GEM, but I can't afford a ten-thousand dollar mount these days. Refractors are more usable for imaging on my Ford and Chevy mounts. OK, so what makes a refractor better for imaging? Three things, I’ve found, speed, focusing, and weight. By “speed,” I am referring to the telescope’s focal ratio. As you may be aware, what matters when determining how bright an extended object (a galaxy or nebula) will be to your camera and how long your exposure will need to be to adequately record it is the telescope’s f-ratio. F-ratio for f-ratio, the only thing more aperture gets you on extended objects is larger image scale. The typical SCT is at f/10, and that requires punishingly long exposures to properly expose dimmer objects. The average apochromatic refractor, in contrast, comes in at f/5 – f/7. Getting these smaller focal ratios with an SCT will require a focal reducer, which can cause illumination problems, vignetting, among other things. The average f/10 8-inch or larger SCT has another liability thanks to it aperture and higher focal ratio: long focal length, as in 2000mm and longer. If you’ve tried deep sky astrophotography, you know with every increase in focal length, tracking becomes more critical. Your mount will have to offer excellent tracking, and you may have to guide it even during shorter exposures if your pictures are to have round stars. Alas, the mounts most of us can afford are challenged by long focal lengths, and it’s difficult to get untrailed stars even with guiding. Focusing as done in SCTs, with the usual moving mirror arrangement, is also a problem for imagers. I don’t just mean focus shift, the subject moving in the field as you focus, but, worse, mirror flop. As the scope tracks, changes in attitude can cause an SCT’s mirror to move slightly, producing trailed stars if you are using a guide scope for photographic guiding as most of us do. Some modern SCTs have mirror locks, and some of Meade’s newer scopes have improved focusing systems, but almost all SCTs are still saddled with the old mechanics and resulting flop. Finally, mounts always track better with lighter payloads. The GEMs most of us turn to, which tend to be in the Atlas/CGEM class and below, may track very well during imaging with an 80 or 100mm refractor onboard, but can have real problems with 8-inch and larger long focal length SCTs. Certainly you can take good pictures with SCTs; I’ve taken my share over the years. It’s just easier to do, much easier, with a short, fast refractor. If nothing else, astrophotography is less stressful—it can even be fun—with a refractor. I don’t ever remember a time when I was doing long exposure imaging with an SCT that I wasn’t at least slightly stressed out by something. And there you have it. More than a few of you have stared in open-mouthed amazement at the news your old Uncle has become a refractor man. Believe you me, nobody is more surprised than moi. That’s just another example—in a rather long series—of how wrong I was a few years ago when I just assumed this stage of life would be without surprises. Don’t be too sad about this if you’re an SCT enthusiast. I haven’t completely deserted your camp. I still have my Edge 800 and my C11 (though I keep telling myself I will sell Bertha, the 11). None of this says all that much about the basic worth of SCTs. They are still the most versatile scopes, period, and I will always love them (I even have plans for a Solar System imaging project for my Edge C8). No, what my current transition to refractors speaks volumes about is me. Great issue, Unk! I've followed your journey the last couple years closely, because it parallels my own. I''m a bit older (70) and priorities, needs, outlook and my aching bones have evolved in ways I never anticipated. So now me and my AR 102 are happily having fun in a more relaxed, easier style. You've taught me a lot about astronomy and observing, for which I'm grateful. The trick I guess, in all of this, is separating the wheat from the chaff. I think you've got a handle on it. Even I am "idly thinking" (see http://www.cloudynights.com/topic/556452-idly-thinking-about-downsizing-a-bit/?hl=%2Bidly+%2Bthinking#entry7535837) about replacing my TeleKit with something logistically and physically (if hopefully not too much functionally) smaller. I've been having fun with my SW 100ED and I'm not done yet, but just the same I haven't reached the point of chunking my 14.5 incher either. However a 12" or so light(er) weight Dob? Hmmm... now there's something to consider. Less than a magnitude loss on the faint end, lighter weight, smaller to transport. Only thing is dew. But I'm still idly thinking about it. Selling my TK without shipping it would be probably the major challenge.